Results come from doing the right things. It seems as though desire and effort should get you what you want in life. In fact, we’re taught from a very young age, and reinforce as adults, that desire and effort are really all that are required to achieve results. Unfortunately that’s completely false. The world doesn’t work that way, and I suspect this simple misunderstanding is the cause of a great majority of the suffering we experience. Take a set of dominoes for example. If your desired result is to knock down the final domino in a chain reaction, there are a number of things that must be done to achieve that result. The dominoes must be spaced properly, the first block must be struck with enough force to start it tumbling, in the right direction, and so on. It’s really not very complex, but it does require specific things be done to achieve a result. Desire and effort, however, are two things that are not required to produce this result. It doesn’t matter how hard you work if you’re not doing the right things. I could choose to spend hours setting up the dominoes precisely, and if I’ve made the mistake of laying them all face-down instead of standing them up, I will never, ever, ever, get the result I want. Never. Not once. It doesn’t matter how badly you want it if you’re not doing the right things. 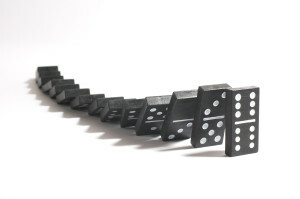 I could really want the dominoes to tumble, but if I don’t push the first one, it will never happen. On the other hand, I could accidentally knock into it and the dominoes would fall every time. Whether I wanted it to happen is irrelevant. They will fall if they are pushed, and they will not if they are not. That’s all there is to it. Fortitude, desire, determination, effort, blood-sweat-n-tears, inner strength, willpower. Accuracy, timing, planning, application, precision, simplicity, continuity. Who’s the strong hero and who’s the weak nerd? The admirable and the pathetic. The passionate and the cold. The problem with this thinking is that the second list describes how reality works, and the first list is a fantasy. The first list (the strong emotions) are helpful only as underlying characteristics to help you do the right things at the right times. When you apply only emotions to actual real world problems, you get poor results. This explains why bad things happen to good people, continuously. When you move through life under the assumption that you can will things to happen, or want things to happen, you’re in serious trouble in terms of getting the results you want. The more you think getting things you want in life is about a matter of ‘trying hard’ or ‘wanting it bad enough’, the poorer your results and track record will be. And of course the opposite is true – once you’re able to see the cause and effect that is reality in life, your world transforms around you immediately, and your results will reflect that. So, dream about a comfortable retirement, but let that passion drive you to carefully set up a monthly transfer to an investment account. Get pumped up to exercise, but be sure to plan your schedule so you do it regularly. And work really hard at your job, but be damn sure that you’re doing the right things. As long as you only embrace the emotional ‘desire and effort’ dogma, and ignore the boring, cold, calculated way the world actually produces results, you will continue to get undesired results in all aspects of your life. Change that thinking, and life becomes easy.